We are proud to host a Little Free Food Pantry in front of the church building! All food is donated directly by church, community, and Grand View campus members. We invite you to buy an extra can of food and drop it off the next time you’re in the neighborhood! 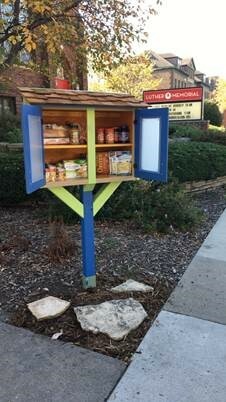 Who Uses the Little Free Pantry? Anyone in need! This often looks like Grand View students who are running out of meals, the occasional east side family, and some church members. * All are invited to leave one and take one when you can. *Please note that our Little Free Food Pantry is intended to only supplement someone’s regular groceries, not provide all. To fight the larger problem of food insecurity, Luther Memorial regularly donates to the DMARC food pantry.